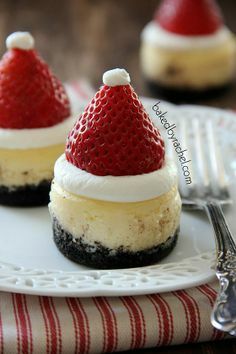 Mini eggnog flavored cheesecakes with a chocolate crust, topped off with fresh sweetened whipped cream and strawberry Santa hats. Go to http://www.bakedbyrachel.com/2013/12/mini-santa-hat-cheesecakes-mini-cheesecake-pan-giveaway/ for the recipe! ← Happy Birthday to Candice! !